HMV partners with FilmFlex to launch video-on-demand service | What Hi-Fi? 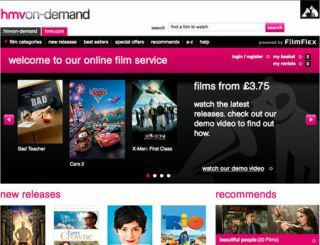 Troubled high street retailer HMV has teamed up with FilmFlex to launch an on-demand film service called hmvon-demand. As sales of traditional DVDs and CDs continue to slide, HMV has been looking at other more lucrative markets. It recently announced an expansion of its headphone and accessories business. The movie-on-demand service will offer films from more than 30 distributors, including all of the major Hollywood studios. Titles will include blockbusters such as the Harry Potter series and X-Men franchise. HMV says that the new film service will initially be available via PCs, with plans to expand to other digital devices, and develop download-to-own and cloud-based services too. Films typically cost £3.75, although we found special offers as low as 99p, with Submarine available for £2.75 and The Dark Knight for £3.49. There are no surprises with the rental terms for hmvon-demand – you get the usual 30-day window to watch the film, and 48 hours to view it once you press play. A soft launch of the service is scheduled for today. HMV joins an expanding number of company's looking to cash in on the growing demand for digital film services, including Netflix – which is launching in the UK and Ireland next year – Amazon's LoveFilm, Tesco's BlinkBox and Google's YouTube. "With a growing number of consumers now incorporating video-on-demand into their viewing and purchasing habits, the time is right to include a digital service into our own offer," says Mark Hodgkinson, marketing and e-commerce director at HMV.